If you're a fan of Brad Paisley, you already know that it's his sense of humor that gives him the extra edge over everyone else in Country Music! Much Needed Laughter from the Master of Light, Fun Country Songs! 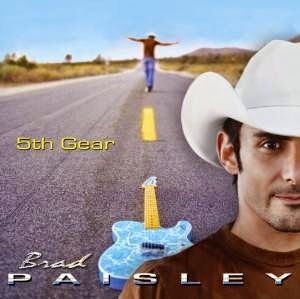 So, there I was, driving in my car with country music blasting as usual, when Mr. Brad comes out blazing a tune from his 2007 Album '5th Gear', called 'Ticks'. Having not heard the song in a while, I had forgotten how the main lyric causes a hemorrhage of laughter! If you're not familiar with that lyric, get ready, because no other love song expresses love quite like this one does! He goes on to sing how, 'the only thing allowed to crawl on you is him' lol! The song was released as the first single for 5th Gear in 2007 and to no surprise, reached the top of the country charts. The song was also a downloadable tune on Guitar Hero World Tour. When asked about the song, Brad said that 'when you're raised on a farm, 'Ticks' are something you need to think about'. The song is about a funny pick up line a guy uses on a girl he meets in a bar .... 'hey there babe, I wanna check you for ticks' lol. Yep, I'd probably bust a gut if that was said to me. Anyone who's lived in the country (even the city!) knows that Ticks are a real problem! Thank gawd I've never had to be checked for them personally, but I know some who have! Yikes. In fact, when we planted our Birch Tree in the front yard, we spent sometime reading about 'Ticks' and Birch Trees! Then of course there's the over 50 cedar trees we planted in the backyard that had me thinking as well! So far so good. Fingers crossed. This song always makes me laugh. We definitely have ticks and they can & will get in the most personal places! I love my home state, I love our long hikes and trails, mountains and woods, but I do hate ticks. I have a good friend whose brother died of Rocky Mountain Spotted Fever (tick fever). The song is fun, but the arachnid is not fun at all. Still, 3 cheers to Brad Paisley for coming up with a way to laugh at ticks. oh my gawd, that's sad Cynthia, so sorry to hear that. My aunt's kids used to get them from playing outside (they lived in a small country town and the kids were always outside playing of course). Love Brad Paisley songs and this is a good one! he's such a classic isn't he, lol!